Never having been to Snowdonia in Wales before, my mind conjured up an image of what I might expect to see. Mountains certainly, deep valleys, yes of course, brooding clouds and light casting its spell on the landscape; well hopefully all of these combined in one picture. With this imaginary view in my mind, I was delighted to make this photograph of what must be one of the most majestic mountains in Snowdonia, apart perhaps from Snowdon itself. 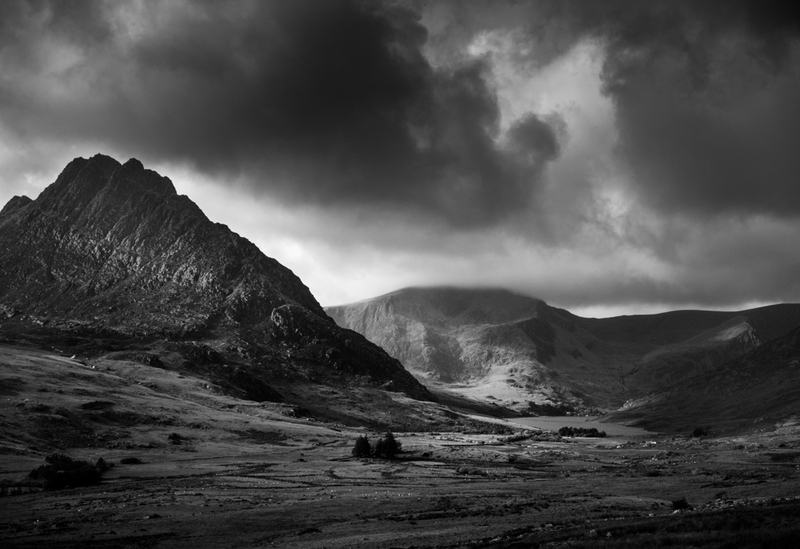 Tryfan is just over 3,000 feet high and its dramatic profile leads the eye down towards Llyn Ogwen, a lake which lies at the foot of this rocky peak. From a vantage point on the northern side of the valley I waited for the morning light to break through the clouds, illuminating the lake and the valley in the distance – and the view I had visualised became a reality. At the mountain’s peak there are two monoliths, which from the valley floor given the appearance of two people who have reached the summit. They are called ‘Adam and Eve’ and are only 1.2 metres apart. For those brave enough to step from one rock to the other, it is said that you gain the ‘Freedom of Tryfan’. I’m no climber so I am just happy to admire ‘Adam and Eve’ and Tryfan from a distance! To view a larger version click on the image. Thank you James. It’s certainly somewhere I would like to return to one day. Thanks for your kind and appreciative feedback Andy. great photo! been there many times and as mentioned above, this does great justice to the place..
Makes me wish I could tour Wales again. Thanks Vicki. Hope it back happy memories of when you were able to visit Wales. An absolute cracker of a shot Alan. Thanks very much James. It was worth waiting for the right light.